You'd think that now that my kids are in school I'd work faster on quilting stuff, but I'm not. I do sew and quilt a little each day, just not much. 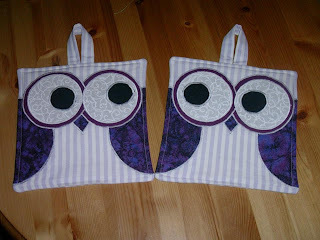 I will say that I've been getting great feedback about my owl potholders, both in english and danish. These are some pictures that were sent to me! aren't they all cute?? so different and yet so cute. I'm trying to keep myself motivated...I don't want the winter to get me down...I need to keep moving. I hope you find some mojo soon! Right there with you on the energy level. I got out for a short walk today, it was beautiful here. It really helped me light a fire in getting things done. Nothing better than fresh air and sunshine. Love our chats. Thank you. I got my mug rug and fabric squares. I really appreciate your thoughtfulness. My kids really love the elephant and were very animated when it came out of the envelope. I really love those little owls, they're so original! I can see a baby quilt made from that cute pattern. ps - I'm originally from Fayetteville! 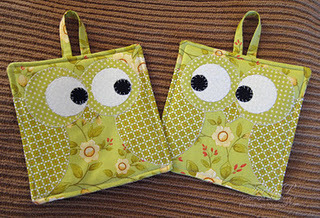 Absolutely adorable and much to cute to use.